Nuclear weapons are destructive devices that derive their power from nuclear reactions. The term weapon refers to devices such as bombs and warheads designed to deliver explosive power against an enemy. The two types of nuclear reactions used in nuclear weapons are nuclear fission and nuclear fusion. In nuclear fission, large nuclei are broken apart by neutrons, forming smaller nuclei, accompanied by the release of large amounts of energy. In nuclear fusion, small nuclei are combined with each other, again with the release of large amounts of energy. The production of neutrons in this reaction means that fission can continue in other uranium-235 nuclei. A reaction of this kind is known as a chain reaction. All that is needed to keep a chain reaction going in uranium-235 is a block of the isotope of sufficient size. That size is called the critical size for uranium-235. One of the technical problems in making a fission bomb is producing a block of uranium-235 (or other fissionable material) of exactly the right size—the critical size. If the block is much less than the critical size, neutrons produced during fission escape to the surrounding air. Too few remain to keep a chain reaction going. If the block is larger than critical size, too many neutrons are retained. The chain reaction continues very rapidly and the block of uranium explodes before it can be dropped on an enemy. The simplest possible design for a fission weapon, then, is to place two pieces of uranium-235 at opposite ends of a weapon casing. Springs are attached to each piece. When the weapon is delivered to the enemy (for example, by dropping a bomb from an airplane), a timing mechanism is triggered. At a given moment, the springs are released, pushing the two chunks of uranium-235 into each other. A piece of critical size is created, fission begins, and in less than a second the weapon explodes. Fission bomb: An explosive weapon that uses uranium-235 or plutonium-239 as fuel. Also called an atom bomb. Fusion bomb: An explosive weapon that uses hydrogen isotopes as fuel and an atom bomb as a detonator. Nuclear fission: A nuclear reaction in which an atomic nucleus splits into two or more fragments with the release of energy. Nuclear fusion: A nuclear reaction in which two small atomic nuclei combine with each other to form a larger nucleus with the release of energy. The only additional detail required is a source of neutrons. Even that factor is not strictly required since neutrons are normally present in the air. However, to be certain that enough neutrons are present to start the fission reaction, a neutron source is also included within the nuclear weapon casing. A fusion weapon obtains the energy it releases from fusion reactions. Those reactions generally involve the combination of four hydrogen atoms to produce one helium atom. Such reactions occur only at very high temperatures, a few million degrees Celsius. The only way to produce temperatures of this magnitude on Earth is with a fission bomb. Thus, a fusion weapon is possible only if a fission bomb is used at its core. Here is how the fusion bomb is designed: A fission bomb (like the one described in the preceding section) is placed at the middle of the fusion weapon casing. The fission bomb is then surrounded with hydrogen, often in the form of water, since water is two parts hydrogen (H 2 O). Even more hydrogen can be packed into the casing, however, if liquid hydrogen is used. When the weapon is fired, the fission bomb is ignited first. It explodes, releasing huge amounts of energy and briefly raising the temperature inside the casing to a few million degrees Celsius. At this temperature, the hydrogen surrounding the fission bomb begins to fuse, releasing even larger amounts of energy. The primary advantage that fusion weapons have over fission weapons is their size. Recall that the size of a fission explosion is limited by the critical size of the uranium-235 used in it. A weapon could conceivably consist of two pieces, each less than critical size; or three pieces, each less than critical size; or four pieces, each less than critical size, and so on. But the more pieces used in the weapon, the more difficult the design becomes. One must be certain that the pieces do not come into contact with each other and suddenly exceed critical size. No such problem exists with a fusion bomb. Once the fission bomb is in place, the casing around it can be filled with ten pounds of hydrogen, 100 pounds of hydrogen, or 100 tons of hydrogen. The only limitation is how large—and heavy—the designer wants the weapon to be. The power difference between fission and fusion bombs is illustrated by the size of early models of each. The first fission bombs dropped on Japan at the end of World War II were rated as 20 kiloton bombs. The unit kiloton is used to rate the power of a nuclear weapon. It refers to the amount of explosive power produced by a thousand tons of the chemical explosive TNT. In other words, a 20-kiloton bomb has the explosive power of 20,000 tons of TNT. By comparison, the first fusion bomb ever tested had an explosive power of 5 megatons, or 5 million tons of TNT. air created as hot air expands away from the center of an explosion. They tend to crush objects in their paths. The heat released in a nuclear explosion creates a sphere of burning gas that can range from hundreds of feet to miles in diameter, depending on the power of the bomb. This fireball emits a flash of heat that travels outward from the site of the explosion or ground zero, the area directly under the explosion. The heat from a nuclear blast can set fires and cause serious burns to the flesh of humans and other animals. Nuclear weapons also produce damage that is not experienced with chemical explosives. Much of the energy released during a weapons blast occurs in the form of X rays, gamma rays, and other forms of radiation that can cause serious harm to plant and animal life. In addition, the isotopes formed during fission and fusion—called fission products—are all radioactive. These fission products are carried many miles away from ground zero and deposited on the ground, on buildings, on plant life, and on animals. As they decay over the weeks, months, and years following a nuclear explosion, the fission products continue to release radiation, causing damage to surrounding organisms. Today nuclear weapons are built in many sizes and shapes. They are designed for use against various different types of military and civilian targets. Some weapons are rated at less than 1 kiloton in power, while others have the explosive force of millions of tons of TNT. Small nuclear shells can be fired from cannons. Nuclear warheads mounted on missiles can be launched from land-based silos, ships, submarine, trains, and large-wheeled vehicles. Several warheads can even be fitted into one missile. These MIRVs (or multiple independent reentry vehicles), can release up to a dozen individual nuclear warheads along with decoys far above their targets, making it difficult for the enemy to intercept them. Even the ability of nuclear weapons to release radioactivity has been exploited to create different types of weapons. Clean bombs are weapons designed to produce as little radioactive fallout as possible. 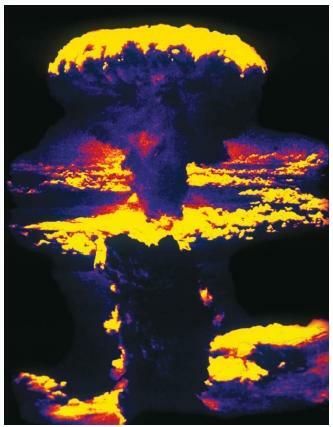 A hydrogen bomb without a uranium jacket would produce relatively little radioactive contamination, for example. A dirty bomb could just as easily be built with materials that contribute to radioactive fallout. Such weapons could also be detonated near Earth's surface to increase the amount of material that could contribute to radioactive fallout. Neutron bombs have been designed to shower battlefields with deadly neutrons that can penetrate buildings and armored vehicles without destroying them. Any people exposed to the neutrons, however, would die. That phrase is one way of describing radioactive fallout. Radioactive fallout is material produced by the explosion of a nuclear weapon or by a nuclear reactor accident. This material is blown into the atmosphere and then falls back to Earth over an extended period of time. Radioactive fallout was an especially serious problem for about 20 years after the first atomic bombs were dropped in 1945. The United States and the former Soviet Union tested hundreds of nuclear weapons in the atmosphere. Each time one of these weapons was tested, huge amounts of radioactive materials were released to the atmosphere. They were then carried around the globe by the atmosphere's prevailing winds. Over long periods of time, they were carried back to Earth's surface or settled to the ground on their own (because of their weight). More than 60 different kinds of radioactive materials are formed during the explosion of a typical nuclear weapon. Some of these decay and become harmless in a matter of minutes, hours, or days. Other remain radioactive for many years. An example of a long-lived radioactive material is strontium-90. Strontium-90 loses one-half of its radioactivity every 28 years. It can continue to pose a threat, therefore, for more than a century. The special problem presented by strontium-90 is that it behaves very much like another element—calcium. When it falls to Earth, it is taken up by grass, leaves, and other plant parts. When cows eat grass, they take in strontium-90. The strontium-90 is incorporated into their milk, which is then taken in by humans. Once in the human body, strontium-90 is incorporated into bones and teeth in much the same way that calcium is. Children growing up in the 1960s may still have low levels of strontium-90 in their systems—a "long-lasting gift" from the makers of nuclear weapons. The United States and Russia signed a Strategic Arms Reduction Treaty (START I) in 1991, which called for the elimination of 9,000 nuclear warheads. Two years later, the two countries signed the START II Treaty, which called for the reduction of an additional 5,000 warheads beyond the number being reduced under START I. Under START II, each country agreed to reduce its total number of strategic nuclear warheads from bombers and missiles by two-thirds by 2003. In 1997, the United States and Russia agreed to delay the elimination deadline until 2007. By that time, each side must have reduced its number of nuclear warheads from 3,000 to 3,500. Although thousands of nuclear weapons still remain in the hands of many different governments, recent diplomatic trends have helped to lower the number of nuclear weapons in the world. In May 1995, more than 170 members of the United Nations agreed to permanently extend the Nuclear Non-Proliferation Treaty (NPT), which was first signed in 1968. Under terms of the treaty, the five major countries with nuclear weapons—the United States, Britain, France, Russia, and China—agreed to commit themselves to eliminating their arsenals as an ultimate goal and to refusing to give nuclear weapons or technology to any non-nuclear-weapon nation. The other 165 member nations agreed not to acquire nuclear weapons. Israel, which is believed to possess nuclear weapons, did not sign the treaty. Two other nuclear powers, India and Pakistan, refused to renounce nuclear weapons until they can be convinced their nations are safe without them. As of early 2000, a total number of 187 nations had agreed to the NPT. Cuba, India, Israel, and Pakistan were the only nations that had not yet agreed to the treaty.